After a tense campaign, on 9 December 2016 the Electoral Commission of Ghana announced that Nana Akufo-Addo of the New Patriotic Party (NPP) had won the presidency in the first round of voting. His victory represents an embarrassing defeat for the incumbent, John Mahama of the National Democratic Congress (NDC), who recorded one of lowest vote shares ever secured by a Ghanaian ruling party since the reintroduction of multiparty politics in 1992. Not only did Akufo-Addo beat Mahama with 54 to 44 percent of the popular vote, but the NPP also won a clear majority in parliament. This is the third time that there has been a peaceful alternation of power in the country. However, it is the first time that an incumbent has stood and lost. Previously, changes of government have always come when a president was forced to stand down by presidential term limits: in 2000, when Jerry Rawlings stood down at the end of a second term, his successor, John Atta Mills, was beaten by Kufour and the NPP. Two elections later, power passed back to the NDC after Kufour’s successor, Nana Akufo-Addo, lost to Mills in 2008. So why did Mahama perform so badly? It is a rare thing for an incumbent president to lose an election on the sub-continent. Research conducted by Nic Cheeseman has found that incumbents win 88 per cent of the elections they contest. Akufo-Addo’s success defies this pattern, as did last month’s shock election in the Gambia, where Adama Barrow beat President Yahya Jammeh with 45.5 percent of the vote – only for Jammeh to later reject the results and announce that he would seek to have the election overturned in court. We identify four factors that enabled the NPP to wrest power from a sitting president. First, the Electoral Commission has relatively strong legal foundations and has developed a reputation for independence (see Nelson Oppong’s blog). During his time as Chair, Kwadwo Afari-Gyan presided over a number of improvements including the use of biometric registration and verification of voters, and the introduction of greater checks and balances. Although Afari-Gyan stood down in 2015 – and his replacement Charlotte Osei, has been accused of being partial to the government – the system was further strengthened in 2016 by the introduction of electronic vote transmission from the constituency level to the EC’s headquarters in Accra, which made it harder to manipulate the result during the collation process. Second, the police and the security forces are largely impartial, enabling opposition activists to campaign throughout the country – even in the government’s strongholds. This did not mean that the campaign was conducted on a completely level playing field – the government continued to enjoy the benefits of incumbency and had much more money to spend. 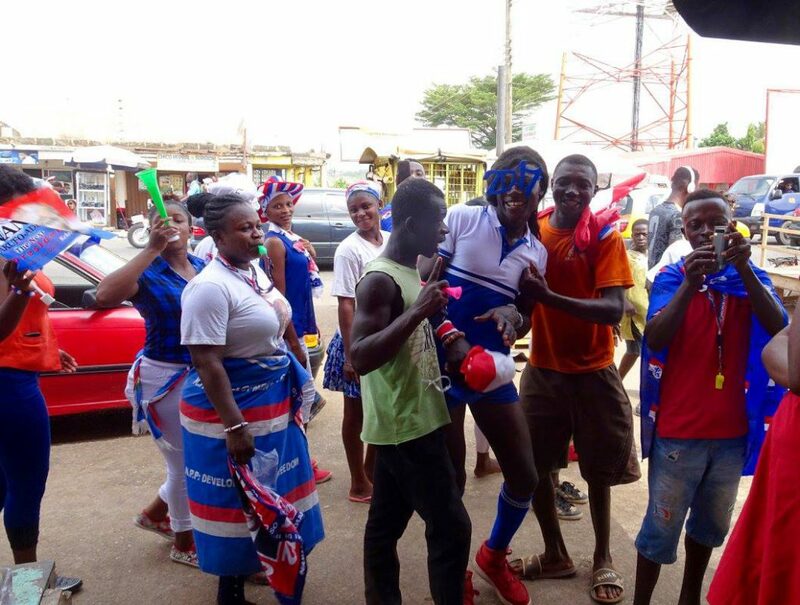 But combined with the considerable degree of tolerance between rival supporters at the local level, it did create the opportunity for the NPP to spread its own message – encouraging NDC loyalists unprepared to vote for any other party to stay at home in order to allow “change” to occur. It was not always this way. In 1992, NPP posters were torn down, and activists were forced to work in hiding. But the political landscape has become considerably more open over time, and opposition activists were willing to publicly state their affiliation, even in areas in which they were a tiny minority. Combined with the ability of the NPP – whose supporters include many of the country’s educated elite – to fund the activities of its agents and activists, this made for a closely contested poll. In many areas, NDC and NPP flags hung side by side, and both parties received considerable coverage in the media. Third, the country’s economic difficulties, combined with the perception that the NDC has lost touch with its own supporters, undermined the party’s ability to mobilize its own supporters. While the NPP managed to repeat or improve the number of votes it won in 2012, the NDC saw its numbers fall dramatically. This is best demonstrated by the difficulties that the ruling party faced in the Volta Region, which is known locally as the NDC’s “World Bank” because of its consistent and overwhelming support for the party. 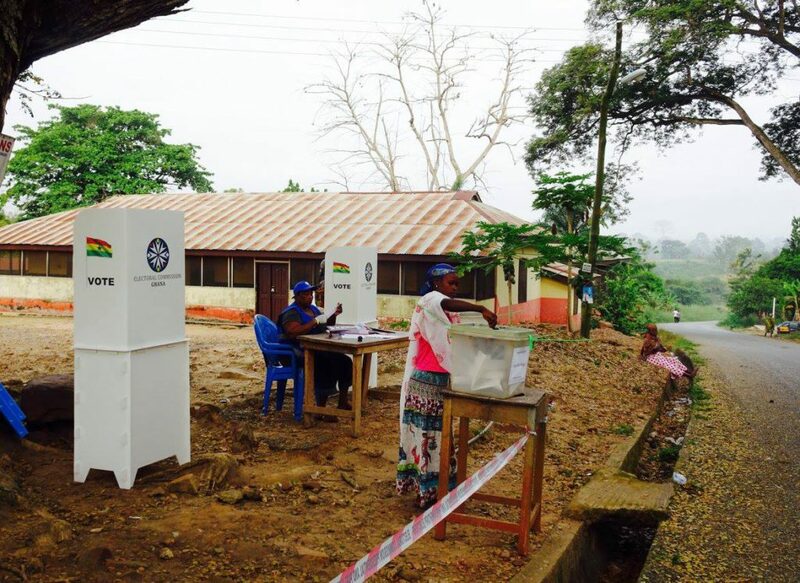 In Ho Central, the regional capital, turnout fell from 78 percent in 2012 to 63 percent this time around due to a widespread sense that the people most loyal to the NDC had not benefited enough from its time in office. Local frustrations were evident, for example, during meetings for the incumbent MP, where some asked why the road adjacent to the rally had not been fixed. During the exchange, NDC party members pointed to potholes as direct evidence of the lack of development that their community had experienced in the past four years. In some parts of the region, this dissatisfaction appears to have translated into an informal boycott of the elections, as many who could not bring themselves to vote for the NPP, simply failed to turnout – with turnout of less than 50 percent in some constituencies. Fourth, the NPP’s call for people to “look at your living conditions and vote” clearly resonated with many Ghanaians and especially with the young who have gone to school and college but struggle to find jobs – with many left living at home “sitting on their parents”. In NDC strongholds, it was younger voters that were most likely to break with their parents and either vote for the NPP, or to stay away from the polls – and persuade their friends to do the same. At the same time, the NPP dismissed the NDC’s emphasis on various government projects – from almost 200 new secondary schools across the country, together with numerous clinics, markets and roads – as the work of any government, and as something that was relatively easy to achieve when you borrow money from the international community. To put this another way, Mahama’s defeat is made up of equal parts: economic decline undermined the credibility of the ruling party, the NDC’s failure to connect to its own supporters opened the door to the opposition, and the country’s open electoral environment enabled the NPP to spread its message and secure a commanding first round victory. It was this combination that condemned Mahama to defeat, and enabled Akufo Addo to make history. Taken together, these developments bode well for Ghanaian democracy. The fact that both parties can campaign throughout the country and that political leaders and the electoral commission once again demonstrated their willingness to play by the rules of the game, represents further progress towards the consolidation of democratic norms and values. The challenge now facing the NPP is whether the party can deliver on its many promises – from jobs to one factory per district – in a way that meets a popular desire for change. If not, Ghanaian voters have made it very clear what is likely to happen at the next elections. Nic Cheeseman is Professor in the International Development Department, University of Birmingham, Gabrielle Lynch is Associate Professor of Comparative Politics, University of Warwick and Chair of ROAPE and Justin Willis is Professor of History at the University of Durham. Accurate description of the situation. Good observation and well made points. Additionally, the subject of corruption also resonated well with the voters.